Sent from my BlackBerry® smartphone from Digicel Pacific "
And my response back to him.....I hope he follows up with his Lawyers/Economists and gets letter out. Despite the NFB suspending the FCA matter, PNGFA must make an international press release to the source of where the report came from as according to the report the company is listed on the Hong Kong Stock Exchange and it is proper that PNGFA says that it has no knowledge of giving out or issuing a FCA/Timber Permit as it is a trick to increase their stock rating to make money. Also copy the letter to all the Stock Exchanges list, so the company is not raising its stock shares from false reports to cheat or raise finance off shore and then disappear. This is not a new trick, it has happened many times before in PNG by companies listed on Stock Exchanges overseas, so please look into that and seek advise and support from your Lawyers and Economist and Stock Brokers in POMSEX. Signs Strategic Collaboration Agreement with Longjiang Forest Industry Group to Develop the Forest. HONG KONG, Dec. 5, 2011 /PRNewswire-Asia/ --Pacific Plywood Holdings Limited ("Pacific Plywood" or the "Group", HKEx Stock Code: 0767) today announced that it has signed a sale and purchase agreement with a member company of I-Sky Group (Holdings) Limited ("I-Sky Group") to acquire 30% equity interest of a member company of I-Sky Group which holds the rights to harvest logs in the Vabari Timber Authority Area covering approximately 65,800 hectares ("PNG Forest Project") in Papua New Guinea ("PNG") ("Target Company"). It involves an investment of approximately HK$310 million, and the rights last for 99 years. Upon completion, Pacific Plywood and the member company of I-Sky Group shall enter into the option deed and the shareholders' agreement. Pursuant to which, member company of I-Sky Group will unconditionally grant to Pacific Plywood the option to purchase the option shares representing 70% of the entire issued share capital of the Target Company and grant the control over the board of directors of the Target Group and extra 21% of the voting rights in the general meetings of the Target Company. The Group has also signed a strategic cooperative agreement with China Longjiang Forest Industry (Group) General Corporation ("Longjiang Forest Industry Group") to jointly operate and manage the lumbering business. The PNG Forest Project involves a 65,800-hectare virgin forest in the Central part of the southern coastal area of Papua New Guinea, Pacific Islands. The area is sparsely populated and mostly covered by forest, of which 68% or 44,504 hectares is dense forest. It has abundant quality lumber which has yet to be exploited, and it is estimated that 24,885 hectares of forests can be developed (around 38% of the total area). Under proper management, more forest resources can be developed within the area. Most of the trees in the area are Hopea, Rongmao Fanlomgyan, Water Tupelo, Beech, Sloanea, etc. which can be used in a great variety of construction projects and furniture. The PNG Forest Project has a yield capacity of 105.5 cubic metres of lumber per hectare, including 82.2 cubic metres of lumber with the diameter at breast height of 40cm or more, per hectare. The total lumber available for development is projected to be 2,626,000 cubic metres. Mr. Huang Chuan Fu, Deputy Chairman and Executive Director of Pacific Plywood, said, "Asia-Pacific is an important hardwood production region with a production volume of 95,000,000 cubic metres or above between 2007 and 2010. The Asia Pacific region has become the region with the fastest growth in demand for timber in recent years. Demand for tropical timber from China constitutes 23% of the total production volume in Asia-Pacific region. With the huge market demand and growth potential, we are set to achieve new heights in the hardwood business through the PNG Forest Project." Mr. Bi Weixing, Deputy General Manager of China Longjiang Forest Industry Group said, "Longjiang Forest Industry Group is the largest and experienced forest industrial group in China. We are pleased to collaborate through this agreement with Pacific Plywood to form a forestry expert team for the PNG Forest Project, providing professional advice and assistance in development and operation. We have strong confidence in the prospects of the PNG Forest Project." Longjiang Forest Industry Group is one of the top 57 large enterprises in China and the largest state-owned forest region and forest industrial group in the country. Its production and operation system integrates technology, forestry, industry and trading to provide one-stop production as well as supply and sales services to fully exploit forest resources. With more than 15 years of experience, the R&D and design team of Longjiang Forest Industry Group boasts expertise providing a solid foundation and professional ancillary services. It has completed many domestic and overseas large forestry R&D projects and other research, design and construction projects such as forest research, operations planning and infrastructure engineering. Mr.Huang added, "With the view to enhancing the management efficiency and technology of PNG Forest Project, we will strengthen the technical and professional team running the project. The Group is pleased to enter into a strategic alliance with Longjiang Forest Industry Group today. We believe the professional guidance and advice provided by Longjiang Forest Industry Group will significantly enhance our management and development capabilities in forestry projects." Ms. Aira To, Chairman of I-Sky Group said, "PNG has very abundant forestry resources and is one of the important hardwood sources in the world. According to the statistics of International Tropical Timber Organisation, PNG recorded an output of 3,720,000 cubic metres of wood products including industrial logs, sawn timber, veneer, plywood, etc, in 2010, with an export volume of 2,940,000 cubic metres and a total export value of US$374,000,000. The resources in Vabari Timber Authority Area have not been exploited yet. The large reserves and top lumber quality within the area dovetail with the favourable national policy and give us very promising prospects in the export to Australia and Asia markets"
Mr. Huang concluded, "The Group has been identifying opportunities to develop the forestry business and actively seeking business partners to expand into related plywood business. Therefore, the acquisition of the PNG Forest Project is of great significance to us. Looking ahead, the Group is leveraging our own strengths to develop and penetrate different segments of the forestry industry, such as lumbering, processing, and sales. Our aim is to grow into a leading international forestry company. Meanwhile, the Group is also continuing to explore other acquisition opportunities and potential projects, so as to diversify our business and generate fruitful returns to our shareholders." Pacific Plywood Holdings Limited was listed on the Stock Exchange of Hong Kong in 1995 with stock code of 0767. The Group primarily engages in the business of money lending, provision of credits, securities investment and corporate secretarial and consultancy services. The Group has been exploring investment opportunities in the forestry industry and actively seeking business partners to expand into the forestry business. Longjiang Forest Industry Group is one of the first 57 large enterprises in China. It currently has 140 members at the grade of county level or above, 88 enterprises (51 of which are middle-sized to large enterprises in the country),52 public sector organisations and a total of 725,000 staff. The total operating area is 10,060,000 hectares (representing 1/4 of the area of Heilongjiang province). The Group has formed four pillar industries namely forest production, timber production, forest products industry and diverse operation. As the largest state owned forest region and forest industrial group in China, the Group has also formed the production and operation system which integrates technology, forestry, industrial and trading and one-stop production, supply and sales services to fully exploit forest resources. I-Sky Group (Holdings) Limited is an integrated company in Hong Kong. It engages in property development, construction, premises renovation and furniture, interior design, aesthetic medicine, jewelry, entertainment businesses and has investments in logging, mining natural resources, hotels and property development projects. Its member company Skywalker Global Resources Company Limited focuses on mining woodland, constructing roads, housing, schools and medical establishment in Nuku Maimai, PNG in effort to improve the quality of living of local people. Pacific Plywood Holdings (HKG:0767) has agreed to sell 51% interest in Delta Wealth Finance Limited together with HK$44.236 million shareholders' loan to connected person Favor Way Investments Limited for HK$52 million. The company expects to realize a book loss of HK$7.812 million from the disposal. HK$48 million of the consideration will be set off against the convertible notes with principal amount of HK$48 million issued by Pacific Plywood under an earlier sale and purchase agreement, the amount of which will be cancelled upon setting off. The net proceeds from the disposal will be principally utilized for the development of the finance businesses of Pacific Plywood and/or financing any acquisition opportunities identified/to be identified by the company. Delta Wealth is principally engaged in the business of money lending and provision of credits. Its profit after tax for the year ended 31 March 2011 was HK$2.632 million. Pacific Plywood has also entered into an MOU in relation to the acquisition of the target company, Profit Grand Enterprises Limited, which has entered into a project agreement with the owner of the forest in the Vabari Timber Authority Area in the Independent State of Papua New Guinea with the size of 65,800 hectares. In the event that the relevant preliminary due diligence results are satisfactory, Pacific Plywood will enter into a conditional sale and purchase agreement with the vendors for the acquisition of the target company. Pacific Plywood is in negotiation with a PRC corporation with wealthy forestry experiences for a strategic alliance cooperation for the operating and management of the forest. The PRC corporation will allocate suitable expertise on advising the board of Pacific Plywood on management and operating the forest and arrange skilled labour for the development of the forest. ONE man and his daughter are the sole shareholders of a Gulf Province landowner company that holds vast tracts of forests purportedly on behalf of their clansmen. The SABL Commission of Inquiry was further astounded to learn the two-person company does not have any existing files with the Department of Lands and Physical Planning under the Special Purpose Agriculture and Business Leases. The Commission of Inquiry was told a Mr Roddey Ila Kwaru and his daughter Avira hold 50 shares in trust for the landowners of the SABL, in the Malalaua sub-district of Kerema. A company search to assist the CoI with its investigations revealed both family members hold the shares in Koaru Resource Owners Limited on behalf of some 2500 to 3000 clansmen. In an amazing twist, their SABL was one of the missing nine files from the DLPP that could not be found and produced. The DLPP’s Registrar of titles file either with the revelation that no Land Investigation Report could be provided. Commissioner Alois Jerewai asked why this was the case prompting Mr Kwaru to clarify that he and his daughter were holding the sahres in trust for all the landowners of the project area. Mr Jerewai further queried if there was a trust bid to which he can hold this shares in trust for the landowners. While Mr Kwaru produced a recently prepared Statutory Declaration of Trust which stated that the shares were held in trust by the Resource Landowners, Mr Jerewai was not satisfied. Mr Jerewai said this was not a satisfactory manner of holding shares in trust on behalf of the landowners and that a proper trust bid be properly executed by landowners and State officials. The Inquiry heard that Koaru Resources Owners Company Limited of which Mr Kwaru is chairman – has subleased to Malaysian owned Pacific International Resources PNG Limited since 2008 for a term of 90 years over portion 323 Milinch Kukipi between Malalaua and Kerema in the Gulf Province over a total of 59,400 hectares. It was also revealed that no development is taking place at present although under the agreement, benefits of a proposed oil palm project will include land rentals of K60,000 per annum from the developer and for the first 10 years after the Oil Palm Project, landowners will receive 10 per cent of net profits with entitlements to 15 percent net profits after another 10 years. Mr Jerewai referred to two developments in which no or poor returns had been received by landowners. “In East Sepik the South Seas Tuna Corporation in which the East Sepik LLG ws promised under the project agreement of at least 5 percent of the profits but no profits have been declared so far and the term of 12 years is about to expire,” he said. He also mentioned the Lihir Gold mine project where for the past 15 years there has never been a declaration of profits. The “land grabbing”issue in Pomio has been described as nothing less than a conspiracy between the National Lands Department and international corporations. Former Prime Minister and Governor of New Ireland Province Sir Julius Chan made this point duding an official welcome for the Greenpeace ship MV Esperanza which he said was engaged in “a noble campaign to return control of the forests, control of the land to the people of Papua New Guinea”. Sir Julius said it was disturbing to note that these companies “are not sneaking in through the back door”. “No, they are carrying out their degradation of the land with the full support and endorsement of the National Government,” Sir Julius said. Sir Julius condemned the SABL program as one that was “a little more than a shallow disguise for uncontrolled logging”. “Companies are given huge tracts of land under 99 year leases allegedly to ‘prepare’ the land for palm oil or copra or other agricultural uses. Sir Julius said he was thankful that there were Papua New Guineans who were rising to the challenge. 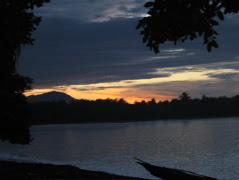 “I am thankful for organisations such a CELCOR, and the other NGOs and civil society groups in PNG who refuse to lay down and allow this land grab to continue. Sir Julius called on the Government to immediately investigate the failure of the Department of National Planning and Monitoring and the National Lands Department to provide full documentation of the SABLs already granted. He was also appreciative of the United Nations and Greenpeace, commitment to do what is right, to reverse these practices before they become irreversible. THE Commission of Inquiry into Special Purpose Agricultural and Business Leases (SABL) in the Western Province has heard more damning evidence of local landowners losing their land to conniving loggers without their knowledge. Commissioner Nicholas Mirou is hearing into SABLs granted for land portions 27c, 1c and 14c in the North Fly District where tragic tales of land loss similar to cases recorded in West Pomio and New Hanover are emerging. Mr Mirou also blasted district administrator Roland Manase Dimonai for signing away the Land Investigation Report without exercising due diligence. Oral testimony at the inquiry indicated that most customary landowners living on or within the SABL boundaries had not consented for their customary lands to be acquired by the State and later transformed into SABLs. Mr Mirou heard that no awareness was conducted by Government officials, particularly from the Department of Lands at Waigani and also from within the Lands Division of Western Provincial Administration or officers from the landowner company, North East West Investment Limited (NEWIL), informing the people of what the SABL was and how it would impact on their livelihood. Acting adviser for division of lands, Western Province, Imen Papa said there had been a lack of awareness and claimed he had not been consulted with regards to the SABLs. He told the inquiry that he had not perused the relevant land investigations reports, which he claims had been brought to him by officers of the potential developer company, Independent Timbers and Stevedoring Ltd, who had endorsed the information in the report as being factual. He added that although he signed the Land Investigations Reports, he did not physically walk the customary land boundaries. Mr Giwi Giwi of the Siom clan of Tiomnai village within the SABL Portion 27C said he had not been aware that his clans land had been acquired under an SABL, and had only become aware when it appeared in the National Gazette No G218, under the title of the North East West Investment Limited. Mr. Samuel Kepuknai, a former director of NEWIL, representing the Drimskai and Smipen villages along the eastern bank of the Fly River said that he had resigned after finding out that NEWIL had SABL titles to large portions of land totalling to 149,117 hectares and 470,642 hectares respectively described as Portions 27C and 1C. He said there had not been any public awareness at all on the nature of the SABLs, and their consequences on the customary land rights of the people. The evidence given to the Commission also indicate that the customary landowners may have given their consent not for SABLs but for the acquisition of their customary land for the construction of the proposed Trans-Papua Highway, which is an economic road corridor, which would link Western Province, to the Gulf and Central Provinces. It is said that the proposed highway project will bring improvements worth K123 million. Mr Dmonai said that he was only given the certificate recommending alienability of customary land in what is now Portions 27C, 1C and 13C and told to sign only on that page by the representatives of Independent Timbers and Stevedoring Limited. He claimed that he was never given the Land Investigations Reports by officers of the IT & S Limited, who reportedly conducted the land investigations. He said that he had signed the document on the understanding that an access road would be constructed in exchange for harvesting of logs. Mr Mirou, however, pointed out that the District Administrator had failed to practise due diligence on his part, hence allowing for vast tracts of customary land to be acquired for SABL purposes, without relevant landowner consent. The Inquiry also observed that there were irregularities in the Land Investigations Reports which suggested that all clans had the same population, and also that while the term of the lease proposed was for 25 years; the Notice of Direct Grant issued by the Secretary for Lands, including the lease was for 99 years. The Commission of Inquiry is expected to continue its hearings into other SABLS in the province and is expected to conclude on Friday, next week. THE Commission of Inquiry into the Special Agriculture Business Leases heard that an officer from the Department of Lands and Physical Planning illegally carried out a Land Investigation Report (LIR) on more than one thousand hectares of land which is the subject of the inquiry. The CoI also heard that he had conspired with another Lands officer in carrying out the LIR that covers 1058 hectares of land in portion 2485 C of Iarogala 1 and 2 in Papa Village of Central Province. Senior Lands officer, Ata Renagi took on the stand last week and claimed that his colleague (named) had collaborated and carried out a LIR without following due process. “The LIR is defective and illegal,” he told the Inquiry and proceeded to explain that LIR’s were supposed to be carried out by the Provincial Lands officers as they were the Custodians and were mandated to do so, only allowing the national office to intervene in its absence. He said this was evident from the LIR that certain families had not signed in the correct place and the fact that one or two people signed on behalf of all landowners. Mr Renagi claimed that this indicated that some of the LIR’s had been tampered with. “So really, the lands officer dealing with this did not address the people and explain the SABL process and the issue of consent, therefore it was done illegally,” he said. Mr. Renagi, who claims to be a landowner from Papa Village, said he had conducted an awareness program in his capacity as provincial lands officer when he carried out the LIR in 2009 and distributed LIR forms to all of the 14 groups of Papa villages, explaining carefully what the SABL process was. He said that of the 14, only 12 were completed and he had then delivered the LIR’s himself to the Lands Department explaining to the landowners that at all times, their rights must be respected. “The Provincial Administrator then went ahead and endorsed it but the title was issued to Veadi Holdings Limited, despite the Central Provincial Affairs stating that the company could not hold the title as they only represented a minority of landowners,” he said. Chief Commissioner presiding over the case, John Numapo asked the witness whether he felt comfortable giving evidence against his colleague to which he indicated that it was okay. The lawyer presiding over the matter, Natasha Koisen further reminded the witnesses that should he face certain repercussions or face threats over the evidence given, that he was to report the matter immediately to the Commission of Inquiry. “It will be regarded as contempt of the inquiry and carries a penalty,” she said. The Inquiry is also hearing another SABL in the same area that also covers parts of Papa and Boera village was leased to umbrella company, Konekaru Limited. LANDOWNERS not reflected in the Purari Development Authority (PDA) Inc. Special Agriculture Business Lease (SABL) for up to 700,000 hectares of land in the Baimuru District have won a psychological victory. The PDA land title is set to be revoked. This is understood to be one of the largest land leases issued under the SABL lease-lease back provisions for customary land instituted under the Government’s Lands Department’s new reform. Again the Commission of Inquiry (CoI) has uncovered a “bed” of irregularities in the acquisition of the SABL, where the marginalised have been given a voice. This follows a stinging close to the CoI headed by Commissioner Alois Jerewai where Lands Department deputy secretary Romilly Kila Pat yesterday admitted to in PDA acquiring the land title. This follows a further admission by Lands Department officer Lazarus Malasa the previous day, that he had pressure from the “top” to ensure all the instruments were in place, despite knowing that there were discrepancies including lack of awareness in establishing the SABL. The same lands officer is believed has instigated another similar case. The misplacing of the land investigation report as indicated by both Mr Malasa and Mr Kila Pat further fuelled Commissioner Jerewai’s patience in the Lands Department in giving the CoI the “runaround”. This was not the first time as well. Both indicated separately that the land investigation report was misplaced while they were shifting offices. Further pressure from Commissioner Jerewai also sought to force Mr Pat to verbally indicate that the Lands Department would revoke the PDA land title in light of what transpired over the three-day proceedings in Port Moresby. Commissioner Jerewai told all concerned parties that the final findings when completed would be for the benefit of all custodians towards improving the current procedure in place. Amakenairu landowner chairnman Mailau Bero said he was appreciative of the CoI’s role in bringing to light startling facts about the process and the various roles people played from the PDA, the Gulf provincial lands office and the Lands Department in Port Moresby. “The Baimuru people are in the dark as to what is happening on their land. We are not against development, however; it is important that the right process is followed and all rightful customary landowners participate to benefit,” Mr Bero said. You are welcome to our loan firm and we will give you the best of our service.